Jonathan Doughty: Capitain Peloquin is the first post! Capitain Peloquin is the first post! This is a blog about lots of things which all have to do with me. I suspect there will be professional and personal content here, but you only have to read what you want. This post concerns our attempts at a medieval recreation rapier practice (with the USM Blade Society in Portland, Maine) to use the drawings and translated text of a fencing manual that dates, roughly, to the late 1500s, or perhaps a bit earlier. More about the dates in a moment. The manual, "Le Cabinet d’Escrime de Capitaine Péloquin" has only one extant copy, in the Hague. This copy purports to be a gift from the scribe who recorded it to the Prince of Orange, Count Maurice (who should certainly be either the next Disney villain or the next hero in one of J.M Aucoin's historical fiction swashbucklers.) The scribe wanted a job (he says over and over that he'd like to 'live by the feather' which is the best translation evar of the French 'par la plume'.) This is quite an audition piece. 2) Disengage below your opponent's parry, sweep their sword with your dagger and step forward with the rear foot (left in the illustration), changing your target to the heart. 3) Cross your sword foot (right in the illustration) behind your dagger foot and finish the strike while pressing towards your opponent's sword, which is still held by your dagger. That is a LOT of detailed information in one illustration, and we found it quite interesting to work with. Here's a link to the video of Mariel Di' Aria and Doña Rowan working through the motions. The video is embedded below. The last few seconds focus solely on the footwork. We discovered that what we loved about these illustrations was their clarity. They're like a code, see? We found three key things that led us to the beginnings of understanding here. 1) These are from the point of view of you the fencer. FPS for the sixteenth century. You're looking at your opponent's eyes and heart, but those are your swords and your feet. The other guy's weapons do not appear in the illustration. 2) There are two planes here, smooshed together. The vertical plane, which we see best when we look at the eyes and heart of our opponent, is divided into one-foot increments by the horizontal lines and is bisected vertically by the center line. The horizontal plane is defined by the illustrations of our feet (we're the attackers here) and is likewise divided by the horizontal lines into increments of about one foot and similarly bisected. 3) The numbers happen in sequence. 1 for feet is 1 for blade, 2 for feet is 2 for blade and so on. These numbers also appear to basically define tempi, but we've only just begun to look hard at this and there are a LOT of things that are still unclear. There's text accompanying each illustration (which is how we got as far as we did) but the best thing for us was the working of these movements out with sword and dagger against a similarly armed opponent. I refer you again to the video. --the perspective of the illustration. 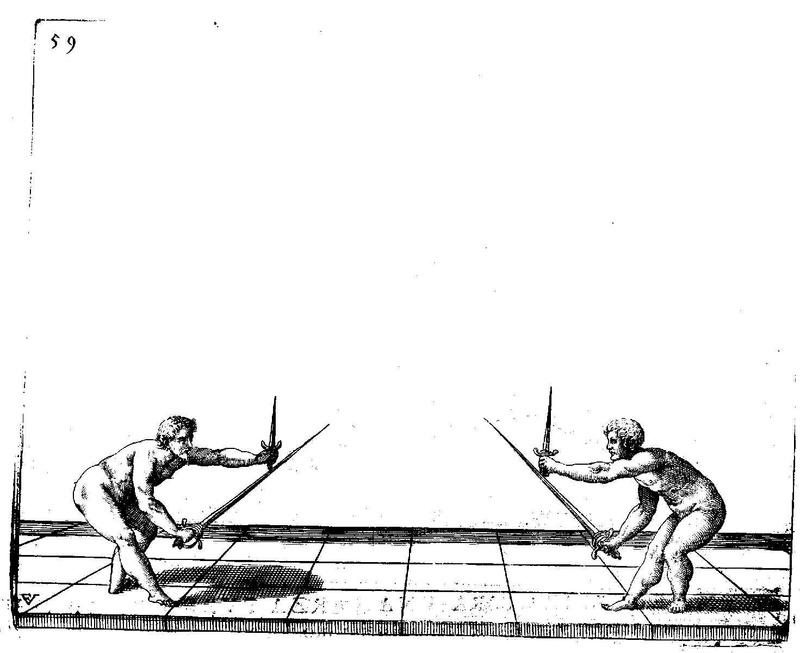 These movements are marked from the perspective of the wielder as opposed to Tallhofer or Fabris, where the plates are from the side and illustrate before and after positions. Peloquin's perspective helps us to see what we're supposed to do and those lines describing the movement of the blade (or, in other pictures yet to come, the hilt b'god!) are like the missing piece for many of us. --the accompanying text were a bit more broken open and a bit more detailed. We learned a lot by doing the movements we thought the picture said to do rather than just what the text said. I want to read the original French. I bet there's some missed nuance. This plate was really fun to decipher. We can't wait to do more! Two last things: The actual text is ok to pass around as long as you keep the copyright info attached to the text. My illustration is part of the larger text under the link above and also here, which contains said copyright info. Rowan and Mariel were super helpful (Ivan was hep' ful) and I appreciate their willingness to have their moving images displayed for all y'all. "FPS for the sixteenth century" is a perfect description for those diagrams. Bugger. It's feint to the eye, then go to the heart. The numbers don't lie. Ugh. We'll try it again this week. No squirrels were harmed in the making of this film.